Dec 13rd, 2016, Adelaide China Southern Airlines and Tourism Australia have deepened their commercial relationship, signing a new partnership agreement that will accelerate their existing marketing activities in China. The three-year Memorandum of Understanding (MoU) was signed today in Adelaide by China Southern Airlines Director General, Commercial Steering Committee Guo Jianye and Tourism Australia Managing Director John O’Sullivan. 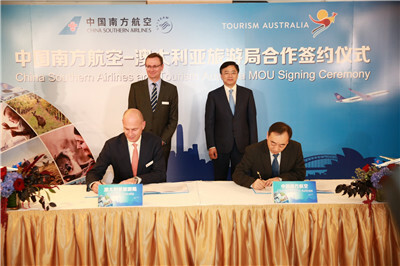 The signing was witnessed by China Southern Airlines President and CEO Tan Wan Geng and Tourism Australia Chairman Tony South. “Australia is a market we value highly and a market where we still see opportunities to expand our operations further, as demonstrated by our decision to add Adelaide to our global network,” he said. In 2015, China Southern Airlines carried 866,000 passengers in the China-Australia market, accounting for more than 30% of market share. With the successful launch of the Guangzhou-Adelaide air service, China Southern currently operates 112 weekly flights between China and Australia in both directions, covering major metropolitan cities in Australia, including Sydney, Melbourne, Brisbane, Perth and now Adelaide and well positioned as the largest air carrier from mainland China to Australia.